Super Bowl LIII will be broadcast on CBS February 3rd at Mercedes-Benz Stadium in Atlanta, home of the Falcons. It is the first Super Bowl to be hosted at the new stadium that opened only two years ago and will be the third Super Bowl played in Atlanta. The extravaganza will also be augmented with live, local and on-site reports from sports reporters and sports directors from TV stations across the USA. Cellular networks will bring in Cell on Light Trucks (COLTs) and Cell on Wheels (COWs) in anticipation of intense cellular traffic. Photo courtesy ATT. While major sports events and venues like the new Mercedes-Benz Stadium in Atlanta have added new technologies that provide higher bandwidths for fans' smartphones during an event, broadcasters need a bit more advance planning to ensure high-quality links. Anyone planning to broadcast from the Atlanta site needs to have a conversation with their bonded-cellular equipment provider to determine what steps may be needed to ensure easy setup and reliable links. Here is a look at three of the equipment providers and what their Super Bowl plans include. Dejero is providing local equipment rental and on-site support for the February 3rd game. Dejero field sales engineers are available and even have extra units on site for game day. As always, customers have phone access to 24/7 technical support. This year, Dejero will offer and showcase its CellSat solution on-site. CellSat provides reliable connectivity in congested RF environments, which is exactly what's expected during and around game day at Mercedes-Benz Stadium. Last November, Dejero received a Technology & Engineering Emmy for 'excellence in engineering creativity,' honoring a decade of achievements in the field of live transmission. CellSat is a blended cellular and Ku-band IP satellite solution that takes the best attributes of both transmission paths and fuses them into one. Dejero CellSat combines HEVC-capable products and services with the Ku-band IP satellite connectivity from Intelsat. The result is one of the most innovative broadcast connectivity solutions available. Said Kevin Fernandes, Dejero VP of Sales, “We’re ready to support our customers to ensure they have the reliable, live connectivity needed to capture one of the biggest games of the year in Atlanta." 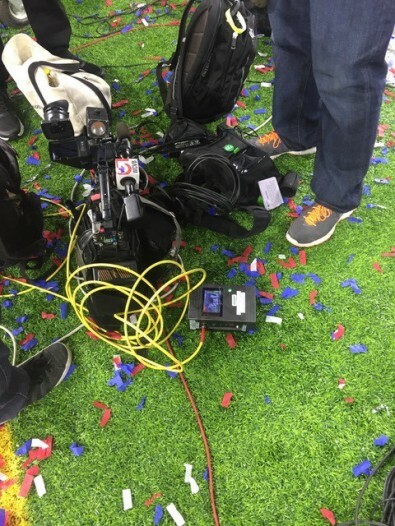 LiveU customers standby for a live shot at last year’s Super Bowl LII in Minneapolis. At LiveU, Pierre Kawka, Director of Strategic Projects says the company has a private Wi-Fi hotspot location covering the NFL Experience at the CNN Parking Deck, which faces the Atlanta Mercedes Benz Stadium. The company will also offer a Wi-Fi hotspot outside of the NFL area secure zone. “It's not too late to rent a LiveU unit for the big game. We will have additional equipment onsite in Atlanta to help support last minute needs. Spare units will be available,” said Kawka. TVU Networks will be present and highly visible at the Super Bowl 2019 as has been customary. TVU was literally on the field for Super Bowl LII postgame reports. “We will have a fully credentialed technical staff of three in theatre starting 6 days prior to the game. The field team will have spares and loaners and will be patrolling the venues and the press areas around the stadium checking in with our customers and offering advice and assistance as needed,” Bell said. “Experience has lead us to avoid putting in fixed infrastructure. We have provided extra bandwidth services in prior years but we learned some important lessons,” Bell said. “1: It’s simply not necessary, the packs work beautifully. I’ve personally seen a pack laying on the field as the confetti lands running pristine HD at 1 second latency. 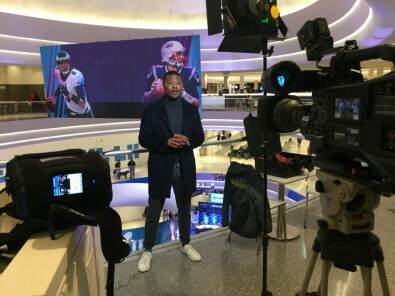 Editor's Note:You can read more of The Broadcast Bridge's coverage of the2019 Super Bowl broadcast and production in multiple articles. Get a behind-the-scenes look at the high-tech production. Just type "Super Bowl" in the home-page search box.